It's Memorial Day. And while we honor those who have given the ultimate sacrifice for our country, we should not forget those who have served. 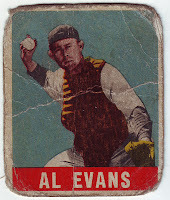 Like many ballplayers of the 1940s, Al Evans interrupted his playing career to serve in the U.S. Navy during World War II. Can you imagine a player today taking a break from a promising career in order to serve? It's almost unheard of. 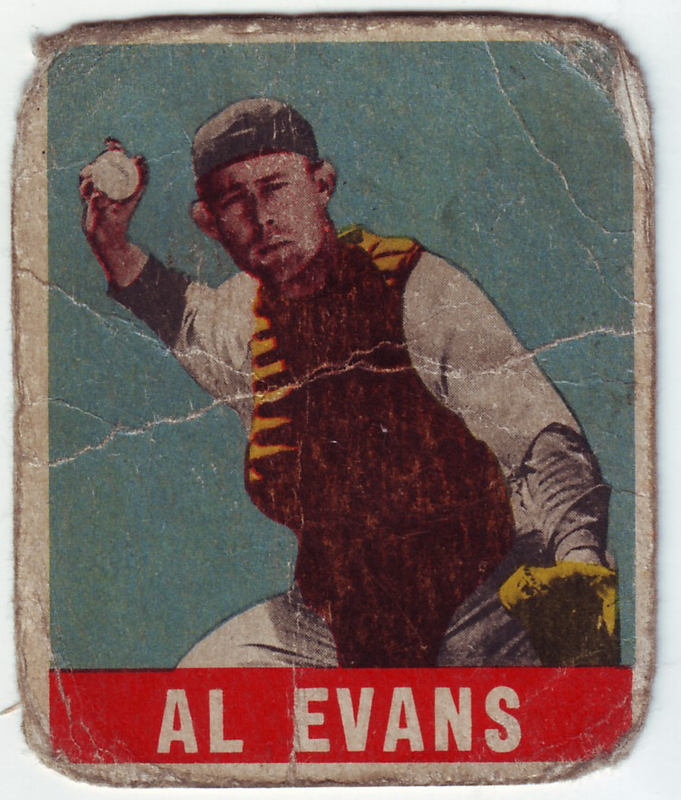 Al Evans might not be a household name when it comes to our national pastime, but it's guys like him we should consider our real heroes. Love this card's design. 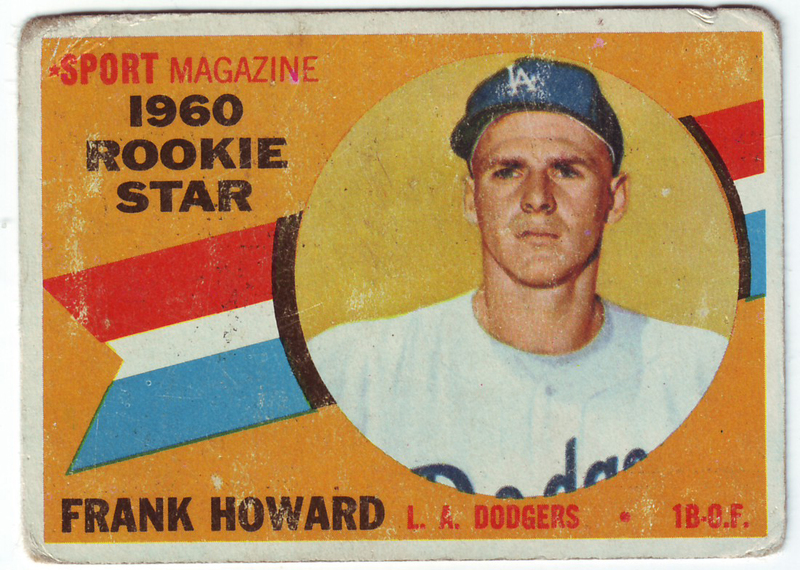 In my opinion, the look of the 1960's rookie subset should have been used for Topps' regular cards. There are only a few players depicted with this design that I have even heard of. The big three: Carl Yastrzemski, Jim Kaat and Frank Howard. Howard was a big dude. At 6-foot-6 1/2, 245 lbs. he was an intimidating figure. No wonder he was nicknamed "The Washington Monument" while playing with the Senators. Howard was also a pretty good player. He was a four-time All Star (68-71) and two-time home run champ (68, 70). In 1960 he was named the National League Rookie of the Year. But my memories of Frank Howard are from 1981. As a 12-year-old, Howard took over as manager of my hometown Padres. Do you have any memories of this great slugger? I was pretty excited when this old card arrived in the mail a few days ago. It was purchased from eBay for a buy-it-now price of $20. That might seem a bit much, but I was happy to pay it for this gem. And this 1951 Bowman really takes you back to what baseball cards were like before Topps came into the picture, in wide circulation, a year later. 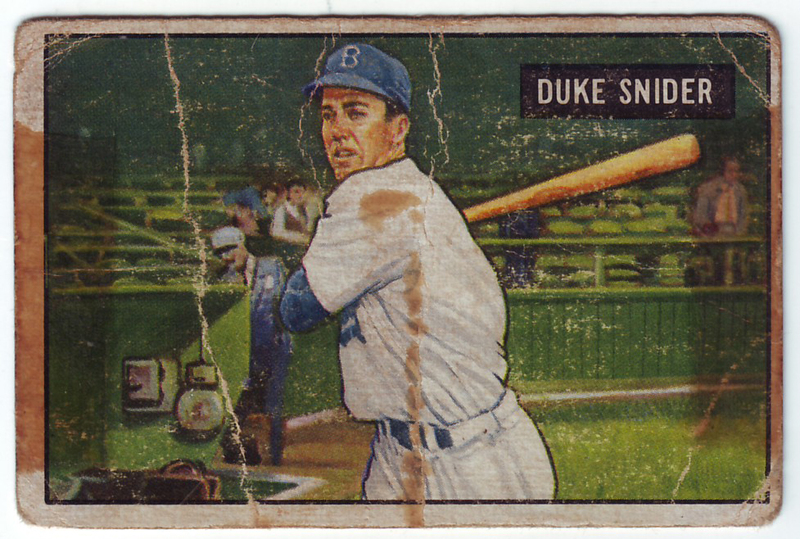 Duke Snider was a major player of the 1950s. Some might argue he was a superstar. And when you have a blog called Poor Old Baseball Cards, that vertical crease doesn't hurt this card's appeal. Check out all those creases and the rounded corners. Beautiful. And what about those tape stains? They give this card even more character. There's no doubt this card was well loved. To a kid in Brooklyn, pulling this must have been like winning the lottery. So far, I have awarded two of five cards from my month-long contest. They have been packed and sent. Last week had no winner. I had plenty of comments but the best had no email address associated to them. 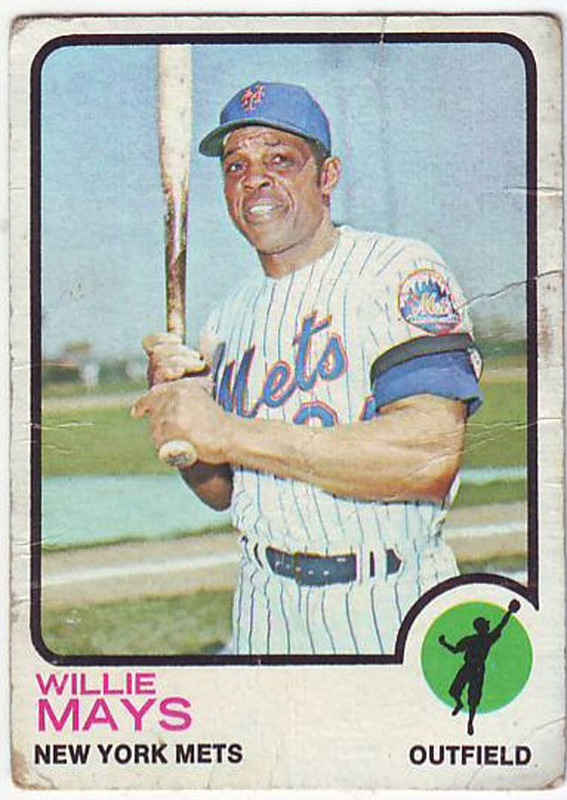 I really want to give away Willie Mays (below, last week's card) and Hank Aaron (above, this week's card) so please comment. You can comment on any post during the life of the blog. The best comment of the week is the winner. In order to win, your user ID you comment with must have an email address associated with it. After notifying the winner via email, the winner has until midnight on the next Sunday (Pacific time) to claim their prize. Also, I would prefer that the same person does not win multiple times. But that doesn't mean you can't comment or can't win. I just want to give as many people a chance to win as possible. 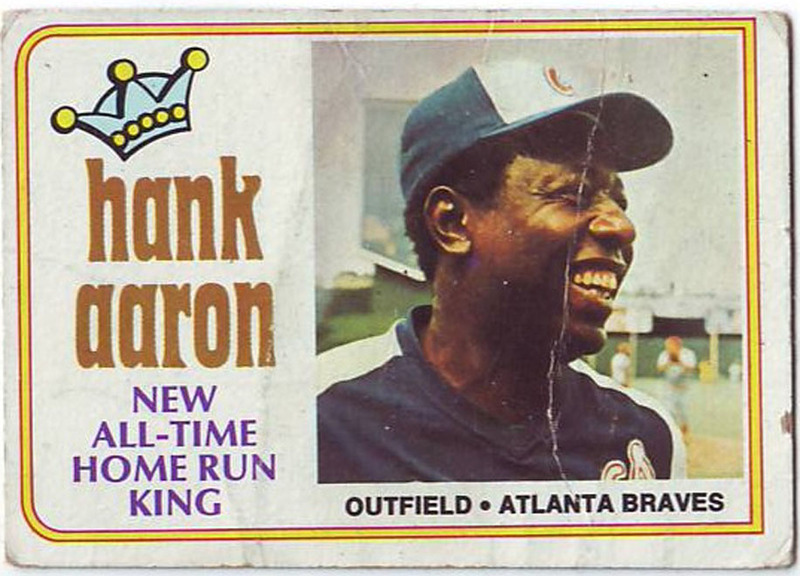 So this week's winner will get a chance at either a 1973 Willle Mays or a 1974 Hank Aaron. The second-best comment will get the other. I think that's fair. Again, if you want one of these poor old baseball cards, please comment. I really want to share my love of these old cards. You have until midnight (Pacific time) on Sunday to win. It's hard to get any information on amateurs ballplayers from Cuba. All I really know about Julio Bringuier is that he was a catcher with Club Casino Espanol. I've posted several Cuban cards but this one is quickly becoming my favorite. I tried to read up a little on amateur baseball in Cuba in the 1940s and what I learned is that most of these guys worked regular factory jobs and played baseball to relieve stress and get their minds off the hardships of life. It wasn't about fame or money. It really was about the love of the game. Sometimes I think we Americans think we have a monopoly on baseball. But baseball thrives in other parts of the world including the island nation only 90 miles from tip of Florida. Here's a poor old baseball card I picked up a few weeks ago for $2.63 including the cost of shipping. Come on, you've got more than that under the cushions of your couch. 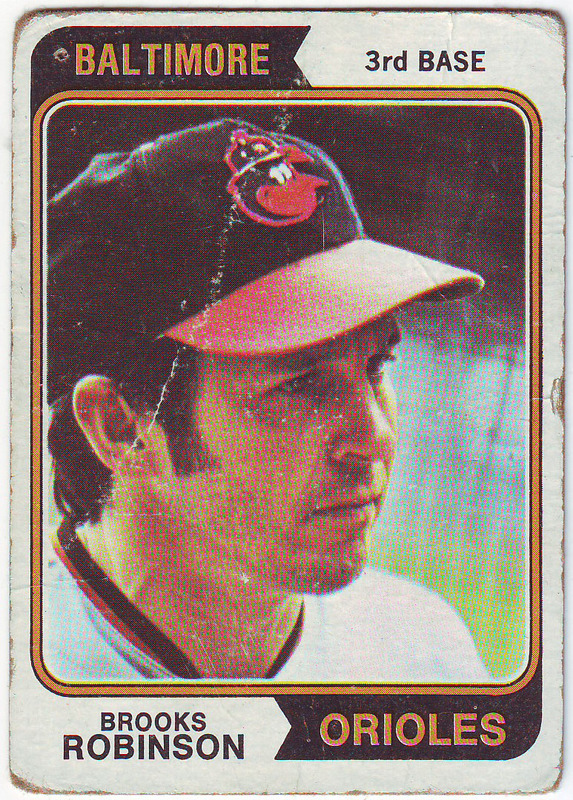 I'm not sure what attracted me more to this card — the cartoonish Oriole on the cap, the crease through Robinson's head or or that pinhole before the word Baltimore. Either way, I'd buy this card for under $3 all day long. You do realize Robinson was one of the game's greatest third basemen ever! A very undrerrated Hall of Famer to say the least. So what if it did come off he side of a cereal box? It's still Roberto Clemente. Clemente is one of those special names when it comes to baseball cards. I consider any card of the slugging Pirate special. Even if it's badly cut from the side of a cardboard box. And if you look hard enough, you can get one at an affordable price. This one set me back $5. If you're lucky you could even get one for free. Next week, I will be giving away a 1969 Topps Bob Clemente. Just leave a comment and qualify to win. This week's giveaway is a 1959 Topps All-Star Warren Spahn. As I write this, you still have a little more than 6 hours remaining to win Spahn. Again, just make a comment on this blog to win. You must comment by midnight (Pacific time) on May 5th to win Spahn, from midnight tonight to midnight on May 12 for Clemente. And no, I will not be giving away this 1962 Post card. It's a keeper.